Manufacturing and Trading of Gears, Geared Motors and Gearboxes. Established in 2000, we Covaai Gears, leverage well qualified and experienced engineers and our facilities and expertise in gear technology to emerge as one of the leading manufacturers of gear boxes. Our range of Gears, Geared Motors & Gearboxes includes Industrial Gearboxes, Worm Gearboxes, Foot Mounted Gearboxes, Foot Mounted Geared Motors, Flange Mounted Geared Motors, Industrial Gears, Spur Gears, Helical Gears, Worm and Wheel Gears, Electrical Motors. Founded by Mr. K.P. Jayapaalan, Mr. K. Anandkumar and Mr. S. Chandralingam, we are a Coimbatore based company marching ahead on the path of success under the visionary leadership of our founders. We utilize our experience & knowledge of international gear box industry to offer products of quality, with economical prices & timely delivery. We strive to incorporate advanced technology in our gear boxes to gain a cutting edge in today's fiercely competitive environment and maintain supreme production process. Our unfaltering efforts have empowered us to maintain high standards of quality in the production process & export of gear boxes. We are eminent manufacturer of gear boxes which are used across the various industries. These products are famous for their durability and strength. The most important factor behind our meteoric rise is our commitment to manufacture products with ultimate perfection and top notch quality. 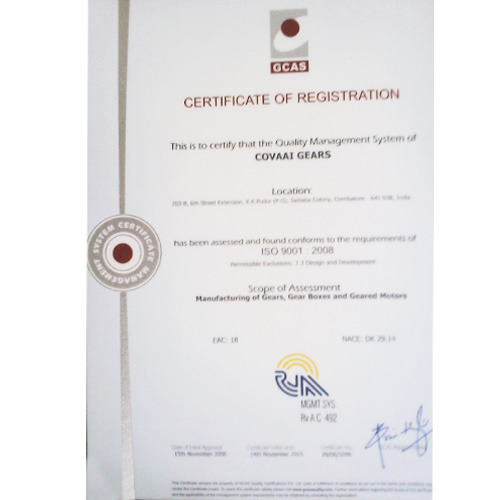 The superior quality of our products is acknowledged by an ISO 9001:2008 certification. Our range includes industrial ground gears, industrial brake motors, ac brake motors, flange mounted geared motors, ac brake motors, internal gear motor, dc gear motor etc. The quality of products is ensured by comprehensive QC tests. We conduct ultrasonic test and chemical composition tests for all the procured raw materials, load test and noise test to ensure the international standard quality in our products. Each stage of our production process, from the procurement of raw materials to the dispatch of final products, is conducted under stringent quality measures. We have a colossal team of knowledgeable and experienced engineers who are adroit in manufacturing high quality Industrial Equipment. The appreciation of the company’s accomplishment rests on the team of professional workers. 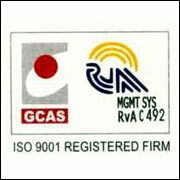 The management along with the staff toils relentlessly for the growth of the company. We procure best quality raw material for manufacturing our products. We use top quality cast iron, steel rounds and phosphor bronze (PB²) for making high strength gear boxes. These raw materials are obtained from the renowned and reliable vendors and suppliers of India and abroad. These raw material are vigilantly checked by our quality expert before utilizing them in the final products to ensure top quality. Within a short span of time, we have ventured into the OE market and have some of the famous corporations in our clientèle. Our products are running in various industries like Textile, Material Handling Equipments, Flour Mills and Pump Industries. We are providing our clients with reliable gear boxes. We share unmatched harmony with our clients. Our low cost, low maintenance and dependable products have enabled us to establish healthy rapport with our clients in India and abroad.